The complete breakdown of the Houston Rockets’ cap situation this summer — from how to acquire LeBron to the luxury tax bill that awaits. The Houston Rockets finished their 2017-18 season with the league’s best regular season record and were one half of basketball (and a few made wide open 3-pointers) away from a Western Conference title and, quite likely, an NBA Championship. But with their season now over, the Rockets must look to the offseason for ways to maintain (and hopefully to improve) one of the greatest rosters in franchise history. 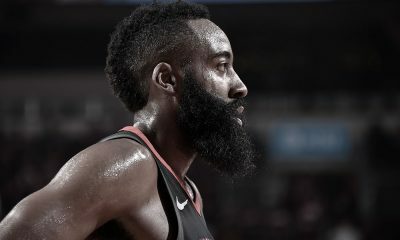 Player salary commitments: James Harden ($30.42 million), Ryan Anderson ($20.42 million), Eric Gordon ($13.5 million), PJ Tucker ($7.97 million), Nene Hilario ($3.65 million), Chinanu Onuaku ($1.54 million), Zhou Qi ($1.38 million, non-guaranteed), Aaron Jackson (team option for $1.38 million, non-guaranteed), Troy Williams ($122,741 dead cap hit – get used to this one), and RJ Hunter ($0 for cap purposes, as he is on a two-way contract). Cap holds: Chris Paul ($35.35 million – Rockets hold full Bird rights), Trevor Ariza ($14.1 million – Rockets hold full Bird rights), Clint Capela (restricted free agent; $7 million – Rockets hold full Bird rights and a right of first refusal), Tarik Black ($3.95 million – Rockets have only Non-Bird rights), Luc Mbah a Moute ($1.5 million – Rockets have only Non-Bird rights), Gerald Green ($1.5 million – Rockets have only Non-Bird rights), Joe Johnson ($1.5 million – Rockets have only Non-Bird rights), and Markel Brown (potential restricted free agent; about $830,000 – coming off a two-way contract). Other Salary Cap Exceptions: If Houston operates over the salary cap this summer (very likely given the cap holds of free agents the team would like to bring back), the Rockets will have access to the Mid-Level Exception (MLE), either the Non-Taxpayer variety ($8.57 million, the use of which would impose a hard cap at the “apron” level – currently projected at about $129 million) or the Taxpayer variety ($5.29 million). Houston will not be able to use the Bi-Annual Exception ($3.35 million), since they used it last summer on Black. In the unlikely event that the Rockets use cap room this summer, they could instead have the Room Exception of $4.41 million at their disposal. Given their salary commitments, and based on current cap projections, the most cap room the Rockets could create (barring trades … yeah, I know) is about $18.38 million. This assumes that Houston renounces its rights to all free agents, doesn’t pick up its option on Jackson and waives Zhou. But since Paul and (likely) Capela are each worth at least that much as a free agent, it is unlikely that the Rockets operate below the cap without some extraordinary salary dump trades. And no, dumping Anderson’s contract alone will not create meaningful cap room on a Rockets team that still features Paul and Capela. 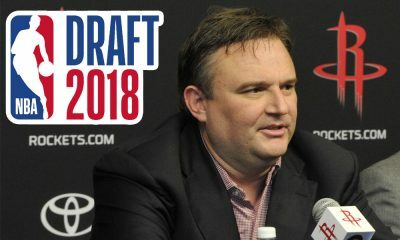 As the Rockets prepare for the NBA Draft and the subsequent free agent season, there will be some internal maneuvering for GM Daryl Morey and his staff to do. Houston will take less than 0.00001 seconds to extend a qualifying offer to Capela ($4.75 million, more than he’d otherwise receive based on his prior salary, due to meeting the “starter criteria” over the past two seasons) in order to make him a restricted free agent and to give the Rockets the ability to match any offers from other teams. More on that below. Extending the qualifying offer does not lower Capela’s cap hold. The Rockets will also likely exercise their team option on Jackson (who is not trade-eligible until July 11 due to when he was signed), especially since his 2018-19 salary is non-guaranteed. While the 2017 CBA has changed the rules regarding how much non-guaranteed contracts can count for salary matching purposes, Houston and Jackson can always elect to amend his contract in order to guarantee his salary, in whole or in part, to the extent necessary to make a trade work. The Rockets can make Brown – coming off a two-way contract – a restricted free agent by extending him another two-way contract for next year (with $50,000 guaranteed) as a qualifying offer. It is unlikely that the Rockets would match any offer of an NBA contract for Brown. The Rockets will enter the 2018 NBA Draft armed with the 46th pick (from Miami, acquired in a draft night trade with Memphis last year), the full $5.1 million of their maximum cash allotment for 2017-18 to spend before July 1, as well as an assortment of players, draft rights and future picks to trade. However, the prospects for a significant draft night trade – something that the Rockets typically seek out – are pretty low. Because Houston remains subject to a hard cap through June 30, the Rockets cannot exceed the 2017-18 “apron” level as a result of any draft night trade. That said, with the Rockets a good $7 million shy of the apron (and $1 million below the luxury tax threshold), the hard cap shouldn’t be a major impediment to a draft night trade. Houston might have some concerns about a draft night trade causing them to have to pay luxury tax, but that would only happen if the trade involves a substantial trade bonus. Of course, a trade could be agreed to in principle, with the actual consummation of that trade not going through until following the July Moratorium. More on that below. Houston will be without its own first round pick (30th overall), which was sent to the Los Angeles Clippers in the big trade for Paul last summer. They are also without their second round pick (the 60th and final pick of the draft), which was sent to the Philadelphia 76ers in a trade for Shawn Long’s non-guaranteed contract (one of many such trades the Rockets made last June in an attempt to exploit a loophole in the new CBA, which grandfathered in the ability to use pre-existing non-guaranteed contracts as salary filler in trades). The Rockets currently possess all of their own future first round picks (starting in 2019) and all of their own second rounders (starting in 2020). As for the draft pick Houston does hold, the Rockets could go in a number of directions. They could elect to use the pick on a player to add to their 15-man roster for next season. However, this is a veteran team in “win-now” mode, so adding rookies to the 15-man roster may not be ideal. Also, last year’s second round pick, Isaiah Hartenstein, agreed to play last season for the Rio Grande Valley Vipers on a G-League contract (for far less than he could have made playing in Europe), so it is possible that Hartenstein may be given a shot at one of those 15 roster spots. They could instead use that pick on an international draft prospect to stash overseas for a year or two. Perhaps the Rockets decide to select a player who has agreed before the draft to sign a two-way contract for next season (a tactic employed by several teams last year), even if that player is not the best talent available at 46. The Rockets could also look to move up in the draft – something they often try to do – although don’t expect them to move up very far. 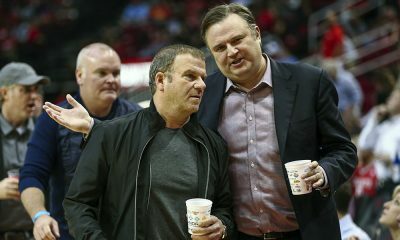 Although Houston still has $5.1 million in cash to spend in trades, don’t expect Rockets owner Tilman Fertitta to open his pocketbook significantly on draft night. As was the case last year, that cash may be earmarked for a possible series of big trades in late June. 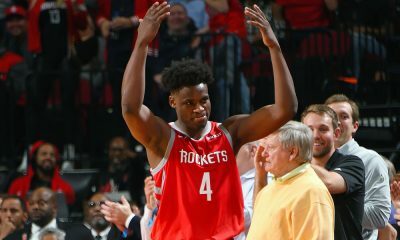 Houston might use a portion of that cash to dump a small salary like Onuaku’s, although the team may prefer to keep his salary on the books until all major trade scenarios – some of which may require his salary as filler – are exhausted. More likely, Fertitta may just hold onto that cash, given the massive luxury tax bill that awaits him after next season. Perhaps more so than in any other offseason in recent memory, the decisions relating to Houston’s own free agents will have far and away the largest impact on the Rockets’ offseason. Chris Paul: When Paul chose to exercise his $24.6 million player option last summer in order to facilitate his move to the Rockets, he turned down the chance to make as much as four years, $149 million as a free agent (or possibly as much as five years, $201 million with the Clippers). There were likely several teams out there willing to give Paul such a contract. The Rockets and Paul may have had an “understanding” that he would be made whole the following summer. The question is, what would that mean? Is Houston going to offer Paul a max contract that would pay him $158 million over four years (or $205 million over five years)? Was the enticement of championship contention – not to mention no state income taxes – enough to get Paul to lower his long-term asking price? Another complicating factor here is that Paul is still the President of the National Basketball Players Association, so he may not want to set a “bad example” by give the Rockets any sort of discount. This one is going to be very interesting and could impact other moves the Rockets make over the next several years. Clint Capela: Few players did more to improve their free agent stock than Capela this past season. At the start of the season, he was a promising young big who might get a decent contract but would probably be a victim of an over-saturated free agent center market. But now, after a great regular season and an even better playoff run, Capela might just be the top free agent center on the market. As a restricted free agent, the Rockets will have the right to match any offer for Capela. Capela could command an offer sheet as large as four years, over $108 million. While that is a rather steep price to pay, Capela is an ideal center for the Rockets’ system on both ends, and there is no way to replace him with a comparable player if they do not match. While few teams will have the cap room available to offer Capela a huge deal, two teams to watch out for are the Phoenix Suns and the Dallas Mavericks. Here’s hoping the Suns and Mavs each select centers in the top 5 picks of the upcoming draft (which features several terrific center prospects like DeAndre Ayton and Mo Bamba), making it less prudent for them to sign yet another young center to a max (or near-max) long-term deal. Another option is for the Rockets and Capela to work out a long-term deal before July 1, thereby avoiding the risks of restricted free agency for both parties. Trevor Ariza: Ariza is the glue that has held the Houston Rockets together for the past four seasons. He has been the quintessential “3-and-D” guy, typically guarding the opponent’s best perimeter player or mobile big. Every NBA team needs a player like Ariza. The Rockets will be tested this summer on the value they place on a soon-to-be 33-year-old small forward whose defensive skills have been slowly diminishing. Ariza also happens to be very close friends with both Harden and Paul, so there are relationship issues in play here as well. Ariza’s value on the open market is uncertain. Given his age and the scarcity of teams with the cap room to spend on role players (even really good ones), it is not clear whether Ariza could command much more than the Non-Taxpayer MLE elsewhere, though he might be able to get more (annually) on a shorter-term deal. Plus, as with Capela, the Rockets’ inability to adequately replace Ariza if he leaves may force the Rockets to overpay him. Luc Mbah a Moute: Mbah a Moute was an absolute steal in free agency last summer for Houston, who landed him for the veteran’s minimum salary. Unfortunately for the Rockets, they only have Non-Bird rights to him, meaning that the most they can offer Luc (without using cap room or another salary cap exception) is 120% of the veteran’s minimum salary for next season. The estimated veteran’s minimum salary next season for a player with ten or more seasons of experience is about $2.37 million, so 120% of that would be about $2.85 million. But given his performance this past season (ill-timed shoulder injury aside), Luc might command well in excess of that in free agency. The Rockets might need to throw most or all of the Taxpayer MLE at Luc in order to keep him. Houston will be hoping to convince Mbah a Moute to take less to remain a valuable piece of a contender. Joe Johnson: Johnson was added late in the regular season after being bought out of the last year of his prior contract. Expected to provide valuable bench scoring, Johnson was rather disappointing in his stint with the Rockets. “Iso Joe” was simply too slow to effectively run the switch-everything defense that propelled Houston to the Western Conference Finals. Just like with both Mbah a Moute and Green, the Rockets only have Non-Bird rights for Johnson. If he is brought back at all, it is unlikely he will be offered more than a one-year veteran’s minimum deal. Tarik Black: Black had a disappointing season in Houston. There were flashes of the defensive fundamentals that had allowed him to stick in the NBA, but Black was far too foul-prone whenever he got extended minutes. Between his overall performance and Houston’s glut of backup centers on the roster, it is unlikely Black will be on the Rockets next season. However, that doesn’t necessarily mean that the Rockets will not re-sign him. While Houston only has Non-Bird rights to Black, his decent-sized prior salary make him an intriguing sign-and-trade candidate if the Rockets need salary filler in trades. Black could be re-signed to a three-year deal (only the first year of which must be guaranteed) starting as high as $3.95 million. That could be the difference in accomplishing a major blockbuster trade. Markel Brown: As noted above, it is unlikely that Brown will return on an NBA contract. He remains a possibility to return on a two-way contract, although it seems more likely that the Rockets will explore other options for that two-way roster spot. Sergio Llull: You had to know I’d drop a Llull reference at some point during this thing, didn’t you?! While not technically a free agent (since the Rockets hold his exclusive NBA rights), Llull – a 6-3 combo guard and the 2017 EuroLeague MVP – remains an intriguing internal option in the Rockets’ long-term roster building plans. Llull’s team (Real Madrid) just won yet another EuroLeague title recently, and he has nothing left to prove playing in the world’s second best basketball league. While it is highly doubtful Llull finally comes over to Houston this summer (there are neither the dollars nor playing time available on this particular roster to entice him to leave his personal paradise in Madrid, plus he’s fresh off an ACL tear that cost him nearly the entire 2017-18 season), he remains an option in 2019 or, more likely, 2020. In the alternative, Llull’s draft rights probably still have trade value – perhaps being worth about a high second rounder – and may need to be surrendered in one of the Rockets’ bigger moves this summer. In his end-of-season press conference the other day, Morey noted, “We’re going to have the pick of the free agents out there, whether they be the high-end ones or whether they be the Luc Mbah a Moutes and Gerald Greens of this year.” When pressed to explain how adding a high-end free agent would be possible in light of his declaration that the Rockets hoped to bring back all their own key free agents, Morey played coy and jokingly referenced “new math” that would make it happen. Well, let’s take a look at that new math. 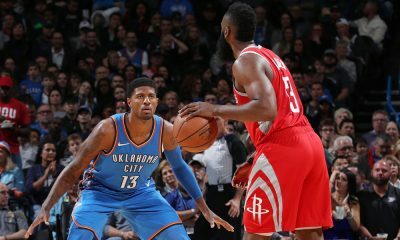 With little (and most likely no) salary cap room available, and with any sign-and-trade of a free agent to Houston imposing a hard cap that would make it difficult to keep the team’s core together, it seems that the most plausible way of adding a high-end “free agent” is for the Rockets to acquire that player via trade before he ever even becomes a free agent. The Rockets and Chris Paul shocked the NBA world on June 28, 2017, when Paul surprisingly picked up his player option –avoiding free agency altogether – and accepted a trade to Houston. This “opt-in-and-trade” avenue now seems much more obvious in hindsight. Let’s take a quick look at a couple of high-end players who can either hit unrestricted free agency this summer or pick up the player option on their existing contract: LeBron James and Paul George. The Rockets would do just about anything to acquire The World’s Greatest Basketball Player. Even as he is playing in his eighth consecutive NBA Finals (and fourth consecutive Finals with the Cleveland Cavaliers), there is a very real concern in Cleveland that LeBron will leave the Cavs (again) this summer. 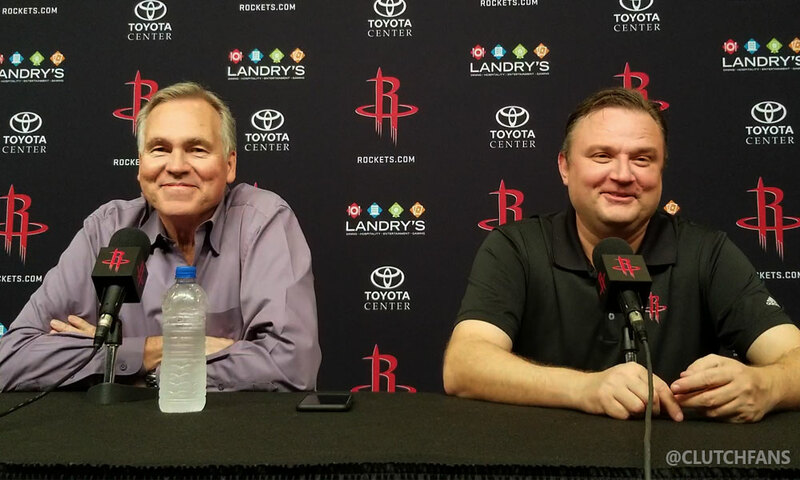 If he picks Houston as his preferred destination, Morey and the Rockets will move mountains to try to make it happen. The last time LeBron left Cleveland (in 2010, when he embarrassed himself and the entire City of Cleveland on an ill-advised televised special), the Cavs nevertheless agreed to sign-and-trade him to Miami in order to salvage something from the loss of their star. The Rockets will be hoping the Cavs are similarly inclined this time around, especially after LeBron brought a championship to Cleveland during his latest stint with them. Interestingly, based on current cap projections, LeBron can actually make slightly more in 2018-19 by opting into the final year of his deal with the Cavs (at $35.61 million) than the largest starting salary he could get in free agency ($35.35 million). Any trade for LeBron will need to include Anderson or Gordon, possibly both. (For those trying to add up salaries, the Rockets will need to send out at least $26,548,568 if they consummate a trade prior to July 1, or at least $28,406,375 if they make a trade after July 1.) If Anderson is not included, then any trade will need to include Gordon, Tucker and a whole bunch of smaller salaries. If Anderson is included, he (along with potentially significant assets) may need to be sent to a third team. Gordon could possibly headline the package going to the Cavs. Further complicating matters is that Cleveland recently traded for George Hill and Jordan Clarkson – two guards with large 2018-19 salaries – making Gordon less enticing as a player asset. The Cavs team salary is so high that they’ll be well over the salary cap even if LeBron walks for nothing; but they also will not want to pay a bunch of luxury tax for a LeBron-less team. The Rockets could possibly find yet another team to take on Gordon in exchange for (less expensive) assets that can be sent to Cleveland, but trades are much more likely to fall apart the more teams get added to the mix. For those into pipedreams, there is a scenario in which the Rockets could trade Anderson, Nene and non-rotation players (possibly including a signed-and-traded Tarik Black) for LeBron, without having to give up any of Houston’s key rotation pieces. But the amount of future draft assets it would take to pull off such a trade is nearly unfathomable. Without fathom. Getting all the stars to align to bring LeBron to Houston will be an extremely difficult task, one that is not very likely (despite what the Vegas odds-makers may speculate). But that won’t stop the Rockets from trying like hell to make it happen. While not quite the caliber of superstar that LeBron is, George represents the ideal wing to play alongside Harden and Paul: a souped-up combination of Gordon’s offense and Ariza’s defense. He is also still only 28 years old. An opt-in-and-trade for George would involve at least two fairly large obstacles. First, the option year on George’s current deal pays him only $20.7 million, a far cry from the $30.3 million starting salary he could command as a free agent. Would George make the same sacrifice that Paul made last season in order to play on a legit contender (rather than with his hometown Los Angeles Lakers, who will certainly offer him the max)? Second, any trade for George would need to involve the cooperation of the Oklahoma City Thunder. The last time the Thunder and Rockets made a big trade, the Thunder didn’t exactly come out of it smelling like roses. Will Sam Presti and company be willing to trade one of their top two players to a Western Conference rival? A trade for George would almost certainly start with Gordon. His salary is close enough to George’s that only a little filler (a couple of minimum guys) would be necessary to match salaries. If George is truly ready to bolt for the Lakers – which would leave OKC with nothing – perhaps the Thunder would view Gordon as an adequate consolation prize who can contribute to their ongoing quest to revive their Western Conference relevancy. The best signifier of whether Morey’s free agency comments prove prescient will probably be how they use the Taxpayer MLE. With an estimated maximum starting salary of $5.29 million and topping out at three years, just under $16.7 million, the Taxpayer MLE hardly represents the type of payday that most really good free agents covet. However, there are some veterans – many of whom have already gotten at least one big payday – who will take less in order to contend for a title. The allure of a rotation spot on a title contender may also draw several potential “MLE-caliber” free agents to Houston as vet minimum signings, just as Mbah a Moute and (later) Johnson were drawn to the Rockets. If Houston only brings back its core guys (Paul and Capela, in particular) – let alone adding more salary via trades or outside free agency – the Rockets’ team salary is going to drastically increase. Fertitta will have to cut a massive check to the league office after next season (and likely beyond) in order for Houston to field a contending roster going forward. The luxury tax – an attempt by the league to promote parity – is a punitive penalty imposed against teams whose payrolls exceed the salary cap by a certain amount. The luxury tax threshold for 2018-19 is currently estimated at $123 million. The luxury tax rate starts at 150% and escalates with each additional $5 million in team salary above the tax threshold. 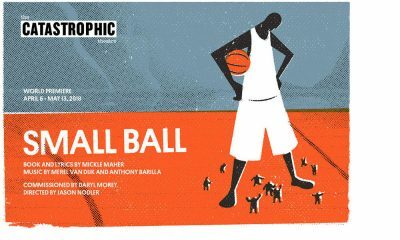 Using an illustration employed by Clutch here, if Paul gets a max contract, Capela gets a max offer sheet that Houston matches, Ariza gets a deal starting at $10 million, Mbah a Moute gets the full Taxpayer MLE and the rest of the roster is filled out with vet minimum salaries, the Houston Rockets’ team payroll could be as high as $285 million, including about $124 million in luxury tax! The highest marginal luxury tax rate for that roster would be 525%! While this illustration is a bit extreme, it is quite likely that the Rockets will find themselves in a less-pronounced version of this situation. It is also why – absent a major trade that requires significant matching salary – Houston may look to dump Anderson’s salary this summer, even if it costs the team some significant assets to do so. The Rockets may have to use most or all of their 2018-19 cash allotment (an estimated $5.2 million) as part of such a salary dump. That cash could instead be employed to a lesser extent to dump some smaller salaries (such an Onuaku’s). Another option for the Rockets is to waive Anderson and stretch his salary over several seasons, but this is a very unpalatable option and should be explored only as a last resort. If Anderson is waived and his salary stretched prior to September 1, his salary would be a dead cap hit of approximately $8.34 million . 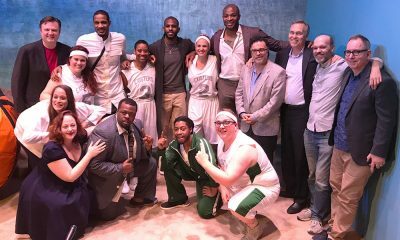 . . for each of the next five seasons. While such a move would save Fertitta a lot of money over the next two seasons, it could have extremely negative consequences for the team once this roster is ready to be turned over and cap room is needed. Even if Anderson agrees to a buyout, or even with the potential for setoff (if Anderson signs with another team in the next two years), that dead cap hit is unlikely to be reduced by much. It would be foolish to expect Anderson to give back much money in a buyout arrangement; and it would be surprising if he received a very lucrative contract from another team in a bad free agent market this summer. Regardless of what the Rockets do next season to mitigate their luxury tax woes, they will likely need to do something before or during the 2019-20 season, when Harden’s Designated Veteran Player Extension (signed last summer) finally kicks in. Next summer, Harden’s salary will soar to $37.8 million, causing Houston’s luxury tax bill to skyrocket (pun very much intended). It could be worse, though. Fortunately, by avoiding the luxury tax in 2017-18, the Rockets would not be subject to the “repeater tax” (an additional 100% tax on top of each marginal luxury tax bracket) until the 2021-22 season at the earliest. 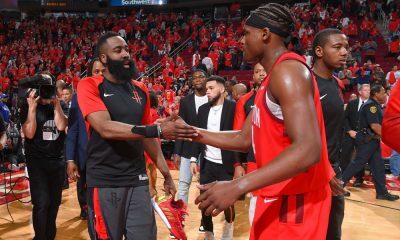 After a remarkable season in which the Houston Rockets fell just short of an NBA title, the task at hand for the franchise is clear: try to keep this core together while also seeking improvement via trades and free agency. Whether an improvement as drastic as a LeBron or George is realized, only time will tell. But even absent such an acquisition, there is room for improvement as the Rockets run it back for another championship gambit. It’s just going to cost Tilman Fertitta a heck of a lot of money to do so.